Accepted Scientific Name: Ferocactus histrix (DC.) G.E.Linds. A barrel cactus, and an outstanding example of massiveness. Together with Echinocactus platyacanthus this is the most abundant and widespread barrel cactus in Mexico. Origin and Habitat: Ferocactus histrix is endemic to Central-Eastern Mexico where it is widely distributed in the states of Aguascalientes, Durango, Guanajuato, Hidalgo, Jalisco, Querétaro, San Luis Potosí, Veracruz and Zacatecas. Altitude range: 1,200 and 2,600 metres above sea level. Habitat and Ecology: The species occurs in xerophyllous scrub, oak forests and submontane scrub. Accompanying cactus and succulent species can be Echinocactus horizonthalonius, Echinocereus blanckii, Stenocereus marginatus, Myrtillocactus geometrizans, Coryphantha clava, Mammillaria uncinata, Neolloydia conoidea, Opuntia microdasys, Jatropha spathulata, Agave filifera, Agave celsii, Echeveria agavioides, Dasylirion acrortichum and Yucca filifera. The development of an adult plant of Ferocactus histrix from seed takes decades (one generation is estimated to be at least 30 years). This was one of the most abundant barrel cactus species, but the population is suspected to be in serious decline due to over-exploitation of mature individuals, flowers and fruits and loss of plants through clearance of habitat for urban expansion. In addition to the direct exploitation, goats and cattle degrade the microhabitats reducing the success of germination and seedling establishment. Human consumption of adult plants for producing "dulces de acitron" (candy) was a significant threat in many areas, but especially near human population centres, as this requires the destruction of mature plants to obtain the parenchyma. This practice is now banned by law, and the candy may only be sold commercially if it is produced from cultivated plants. Ferocactus histrix f. cristata hort. Ferocactus histrix f. variegata hort. Cactus multangularis Moc. & Sessé ex DC. Echinocactus oxypterus Zucc. ex Pfeiff. Echinofossulocactus oxypterus (Zucc. ex Pfeiff.) Lawr. Description: Ferocactus histrix is a colourful barrel cactus usually unbranched, forming a single moderately tall column. Stem: Globular to short-cylindric up to 110 cm tall and 50-60(-80) cm in diameter, bluish green with large, depressed, woolly stem tips. Ribs: to 20-40 or more. Areoles: 2 to 3 cm apart, almost confluent in old plants. Spines: 10 to 12 stout, amber yellow, becoming brown, red to brown at base. Central spines: 1-4 uppermost 2-1 to 3,5 cm, lowermost, much stouter and longer, 4-6(-9) cm long, porrect or ascending, annulate, sometimes flattened or angular in cross section, and often slightly down-curved, except in young plants. Radial spines: Slender-subulate 6-9 2 to 3 cm. long, more or less spreading. Flowers: Bell shaped, 2-3,5 cm long, 2,5 cm in diameter, bright yellow, sometimes reddish; inner perianth-segments linear-oblong, acute, somewhat spreading; stigma-lobes 6, linear, green; scales on the ovary ovate, acute, small, 2 to 4 mm long, somewhat ciliate. It is an obligate outcrossing cactus. Pollen is released 1 to 2 days after anthesis. At this stage the stigma lobes are closed, and the pollinators usually land directly on the stamens to reach the nectary. In this way, pollen can be easily collected. After 2 to 3 days of opening, the stigma lobes expand and are used by pollinators as a landing platform. and pollen from others flowers can be deposited (del Castillo 1994). Therefore, self pollination within the same flower is avoided but the transfer of pollen from one flower to another in the same plant is not, as flowering is sequential. Fruit: Short-oblong, 2-3 cm. pinkish, fleshy and somewhat edible. Often bursting apically to release seeds in liquid. seeds: Minute, 1 mm long, dark brown, testa finely pitted. 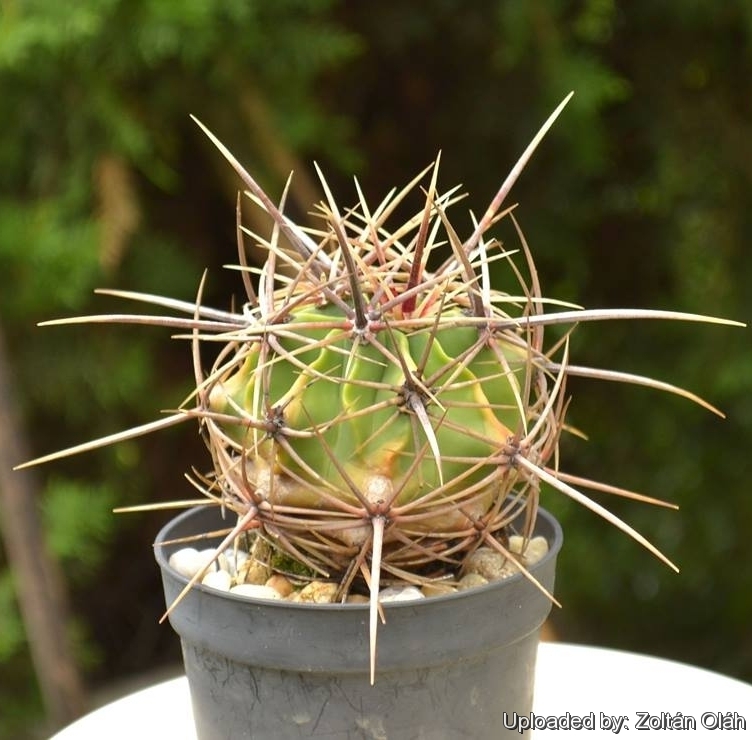 Ferocactus histrix (DC.) G.E.Linds. : is a barrel cactus forming a single column up to 110 cm tall and 50-60(-80) cm in diameter. Distribution: Central-Eastern Mexico from Durango south into Hidalgo. Ferocactus histrix f. cristata hort. : Crested form. Ferocactus histrix f. variegata hort. : Variegated form. Notes: The "biznagas" Ferocactus histrix and Echinocactus platyacanthus Link & Otto are two common barrel cacti of the semiarid highlands of Central Mexico. In pre-Columbian (pre-Hispanic) times, these plants were regarded as being sacred and used for sacrifices, food and medicine. Today, these cacti are used in the candy industry ("dulces de acitrón" or "dulce de biznaga"), as medicine, as a source of food and water for goats and as ornamental plants. 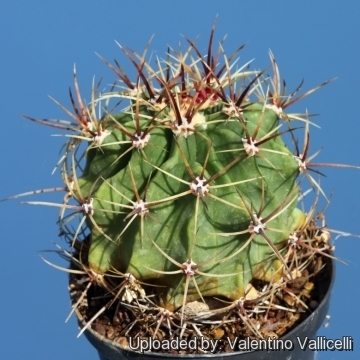 They are probably the most economically important barrel cacti in Mexico. The importance of these species increases with the aridity of the land and its inadequacy for agriculture. The mature floral buds ("cabuches")and fruits ("borrachitos", "biznaguitas" or "jarritos") of F. histrix are consumed by the local people, the latter are sold in local markets throughout the range of the species. In southern Zacatecas and in San Luis Potosí states, the mature floral buds of F. histrix are fried or boiled with red chilli or mixed with fried eggs. The fruits of F. histrix are also used to prepare a non-alcoholic beverage ("agua de biznaga"), or ices ("popsicles" or "paletas de biznaga") for commercial sale in places such as Salinas de Hidalgo and San Luis de la Paz in Guanajuato. The fermented fruits are used to make alcoholic drinks. Currently, the most common use of the parenchyma of both F. histrix and E. platyacanthus is in confectionery (Del Castillo and Trujillo 1991; and see Anderson 2001 for details on the preparation). 9) Del Castillo, R. F., and S. Trujillo. “Ethnobotany of Ferocactus histrix and Echinocactus platyacanthus (Cactaceae) in the semiarid central Mexico: past, present, and future.” Economic Botany 45: 495-502. 1991. 14) Revue de la Famille des Cactées. In: Memoires du Museum d'Histoire Naturelle. volume 17, page 115, 1828. 16) Guadalupe Martínez, J., Sánchez , E. & Bárcenas Luna, R. 2013. Ferocactus histrix. The IUCN Red List of Threatened Species. Version 2014.3. <www.iucnredlist.org>. Downloaded on 31 May 2015. Hardiness: When dormant, the plant is somewhat frost tolerant (down to nearly -5° C for short period of time), but when left out it is more sensitive to frost. However warmth throughout the year will increase the grower's success (at minimum temperatures above 5 degrees centigrade during rest season). During the summer it is best to keep the plants outside where the temperature can rise to over 30 C with no harm to the plant. This plants need a period of cool rest in winter to produce flowers abundantly. Ornamental uses: It is an excellent plant for container growing. It always looks good and stays small. It looks fine in a cold greenhouse and frame. Food uses: The utilitarian value of Ferocactus histrix is well known. The round, succulent stem of this cacti is a vital source of water for thirsty beings in the arid Central Highlands of Mexico. The spongy water-storage tissue from large mature plants of Ferocactus, but also of Echinocactus, and other similar cactus species is prepared in the form of a popular candy known as acitrón or dulce de biznaga, the plant bodies are cut into cubes and boiled in syrup until it crystallizes. The candy is eaten as is or used in pastries, cakes and sweet tamales. The flower buds (cabuches) are eaten raw or preserved and served in a vinegar solution. The fruits, called borrachitos and other names, are harvested and eaten raw or their juice is extracted and used for making popsicles, marmalades, syrups and wine.